Unless you hide veggies in alllll the things…YOU CAN’T SIT WITH US. I used to post muffin recipes all the time on this bloggy boo. They’re just the perfect snackity—hearty, healthy, and tasty to boot! Whenever I make muffins now, I use both almond meal and oat flour. Using almond meal adds a boatload of healthy fats that not only make your hair and skin totally shiny and gorg, but it also helps boost your immune system, fight chronic disease, and combat inflammation! Using almond meal rather than a grain-based flour also helps lower the carbohydrate content of the muffies, which is great for when you want a yummy snack that’s not a total carb bomb. You know I love my carbs, but when you eat a plant-based diet that involves carbs out the wazoo (think beans, rice, whole-grain crackers, quinoa, sweet potatoes, hummus), sometimes you just want a snack that’s not as carbalicious. Because almonds are higher in fat, I find you don’t have to add as much oil to the batter as you would with all whole wheat or oat flour. I get my almond meal at Trader Joe’s and then I simply whiz a cup of old-fashioned oats in the Nutribullet to make oat flour. Sometimes I buy the organic Arrowhead Mills oat flour as a shortcut, but you really can’t beat the price of a hugh jass container of old-fashioned oats! I bought the biggest size of Target brand oats on sale last week for a whopping $2.69! Thirty servings for $2.69? Hellooooo cheap, healthy breakfast! These babies are sweetened with a wee quarter cup of coconut palm sugar, so it’s of utmost importance for you to use SUPER ripe nanners. I’m talking the black kind that you think you should throw away but are secretly the key to the bestest banana bread. If you’re using spotted nanners that are still kind of yellow, you may want to add a couple more tablespoons of sugar. To make these more of a dessert-like muffin, you could up the sugar to a half cup. I think they’re plenty sweet as is, especially with the melty bites of chocolate chips! I like to use coconut palm sugar because it’s less refined and therefore has trace amounts of vitamins, minerals, and phytonutrients, but good old brown sugar will work just fine, too. Coconut sugar also has a lower glycemic index than refined white sugar, meaning it won’t spike your blood sugar as quickly. But at the end of the day, it’s still sugar—so go for the more natural kinds and use them in moderation! Keep in mind that coconut oil is still 100% fat (fourteen grams per tablespoon) with zero fiber, just like coconut sugar is still 100% sugar (four grams per teaspoon). While they do provide some nutritional benefits, don’t go scarfing ’em down just because everyone and their brother promises they’ll lead to miraculous weight loss. There’s no substitution for good old-fashioned clean eating and exercise, my friends…not even tablespoons on tablespoons of organic coconut oil. Another note—if you don’t care about a muffin being vegan, you can always substitute the flax “eggs” for regular eggs (two in this case). I think these would also be fab with some shredded coconut, walnuts, some cacao, and a little nutmeg. If you try anything fun, tell me in the comments! These were adapted from my banana coconut muffins, which is a super old recipe but definitely one of my favorites. Some of the oldest recipes on this site are actually the ones that I make most often, like my salmon burgers, avocado bean burgers, almond butter broccoli stir fry, and tomato, basil and kale quiche. Brace yourself for some seriously funny old blog posts! PS–my almond butter zucchini bars are one of the most popular recipes on the blog, so if you have an extra zucchini, whip up a batch and thank me later! They are one serious present for your face. Now go make these. They’re so fetch. 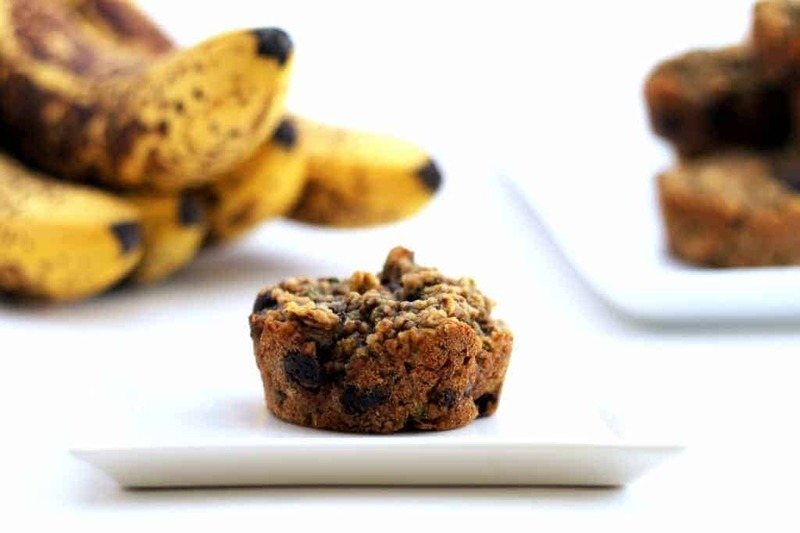 These deliciously moist, vegan, and gluten free muffins are packed with flavor and nutrition! Preheat oven to 350F. Spray a muffin tin with cooking spray and set aside. Combine flax and water in a small bowl and set aside to gel. Using paper towels, squeeze liquid out of zucchini. Add zucchini to a large bowl. Add bananas and mash with a fork. Add coconut oil and vanilla to bowl and stir until well combined. Stir in flax mixture. In a separate medium bowl, stir together almond flour, oat flour, oats, coconut sugar, baking soda, cinnamon and salt until well combined. Add dry ingredients to wet ingredients and mix until just combined, being careful not to over-mix. The batter will be thick. Fold in chocolate chips. Bake for 16-18 minutes. Cool for 20 minutes in muffin tin before carefully transferring muffins to cooling rack to cool completely. Perfection! I love making my own oat flour! Seriously so easy! Do you use melted or solid coconut oil? I actually just used solid coconut oil. Make sure to mix it in well! Another totally scrummy recipe – thank you for sharing it with us. Oh wow, these muffins look fantastic! The texture looks really interesting – I’m not a fan of muffins that are super bread-y and homogenous throughout, so these definitely caught my eye. Looking forward to trying them! Ooo. This looks delicious. I’ve never tried adding zucchini to baked goods. Thanks for sharing! Please send me some…thanks! ;) Looks delicious and love the photos! 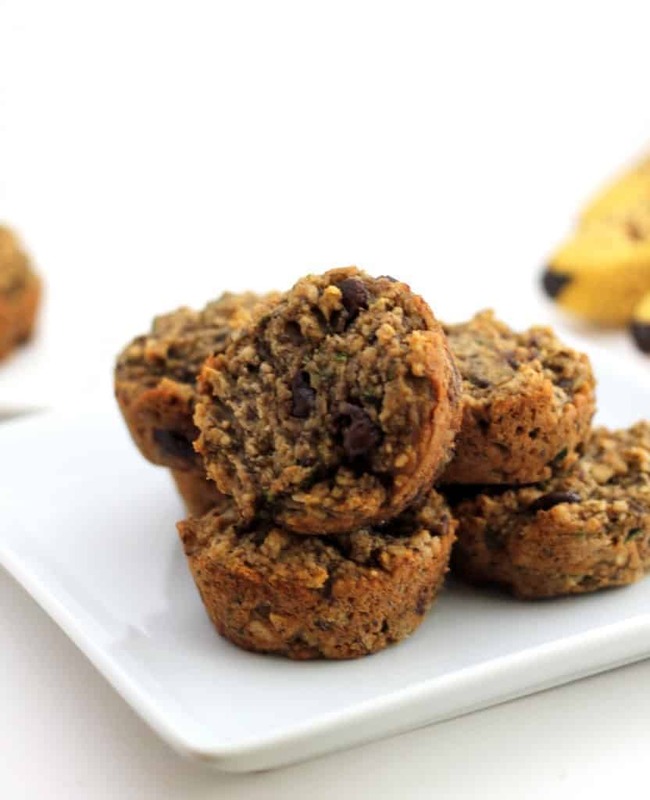 Oooh – you squuezed in veggies and fruits and CHOCOLATE into these muffins!!! Helllooooo yummmy!!!! I adore my own ground up oat flour – the stuff at the store is just way too pricey! Haven’t made zucchini muffins in a while… gonna need to do this again soon! Hey Giulia! Yep, ground flaxseed and whole chia seeds both gel. Either one is fine! Thanks so much for the sweet comment–so glad you’re enjoying the blog! These look awesome! Healthy snacks at their finest right there. These are going on the to make list!! Since they include zucchini, they are totall acceptable to eat for breakfast. I love any excuse to eat chocolate/sweets for breakfast! Ummmmm yes. Breakfast it is! I don’t know what you’re doing with that camera but your photos suddenly more gorgeous than ever before! It’s all thanks to the new camera and some serious practice :) Thanks, lady! “Unless you hide veggies in alllll the things…YOU CAN’T SIT WITH US.” <- I knew you were one of those mean girls all along. Dang, now I either need to veggie-fy ALL of my upcoming recipes or … find blog friends who despise vegetables. But that'd be like denying my heritage. Blog-wise. Okay, I think I can find a way to sneak vegetables into a baked good or two. And your muffins sound pretty awesome. Guillltyyy! You can def sneak some veggies into a baked good or two…I have faith in you! Totes amazing looking. am I right or am I right? Lezbehonest. I sat on that table before you claimed others couldn’t sit. BOOM. So, I went ahead and made these last night – I knew they were coming thanks to your teasers on IG & FB so I had a zucchini and nanners waiting! I could hardly wait, and I was right, they are incredible. Crazy moist and so tasty! Obviously the bites with the choc chips are the best. I had one right out of the oven. :) I don’t think I had ever made vegan muffins before, so fun! My nanners weren’t black but I was too impatient to wait (plus my zucchini was ready to go) so I did add a little more coconut sugar. I filled about 3/4 of a 1/2C scoop, and they are perfect. The chocolate chips and banana help keep it sweet, and really, I can’t stress how PERFECTLY MOIST these babies are. I gave my manager one and told her they were healthy, and she ate it and then goes, “is this thing really healthy or is this like mean girls where they convince rachel mcadams that those fattening bars will burn up all her carbs?” LOL! She also said it was delicious. So, I’m looking forward to a promotion. JK. I am looking forward to eating more of these, though! 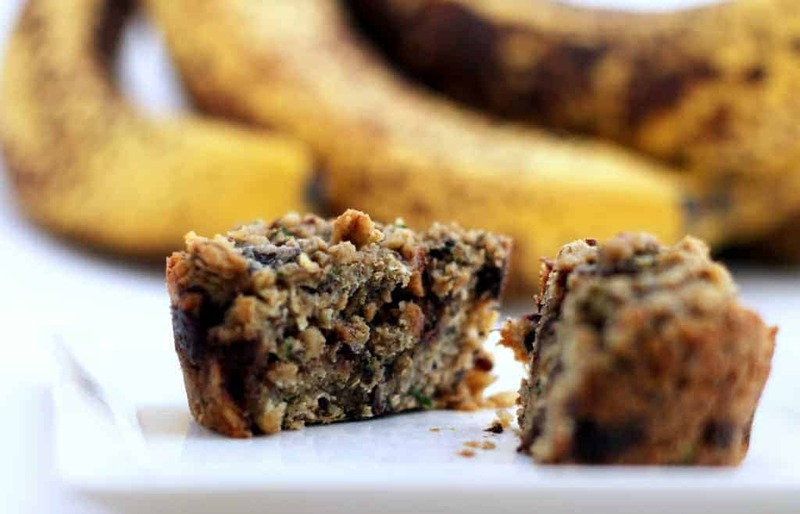 Great recipe, great pics, love healthy muffins, love your guts. These look just awesome! I always love zucchini baked goods, but haven’t made any in forever. I have some unacceptably ripe bananas that would be just perfect for these! My laziness regarding grating zucchini hinders zucchini baked goods…I fully admit it! So I just did a spin on your recipe, and turned them into brownies. I used the oat flour (so easy and I feel so much better than using regular bleached flour! ), did double zucchini, and added sugar (I’m traditional when it comes to sugar), almond butter, egg whites, and cocoa powder. I’m putting the recipe up on my blog tomorrow but don’t worry I will certainly be giving up the credit for my inspiration – Hummusapien! I love your recipes, thanks for sharing them all! That sounds like such a yumtastic spin! Can’t wait to check it out! i have been dreaming of these boys for a while now – thanks a lot for finally sharing the recipe!!! You’re so welcome! Enjoy, my friend! A) I love all the background info on all the ingredients, keep it up! B) I need another zucchini ASAP to make these! I’m so glad you like the background nutrition info! I’m gonna try to include that stuff more often without being boring :) There’s a fine line! You are just the sweetest, Robin! I can’t tell you how great that makes me feel!! I just happen to be eating a piece of banana zucchini chocolate bread right now, so I’m definitely on board with this combo! :) I love your use of oat and almond flour. I need to give these babies a try! Yummalicious!! Ever since I hopped on the almond meal bandwagon, I can’t get off! Alexis, I honestly try every recipe you post. One of my friends sent me your website 1 year ago and have been hooked ever since. Hahaha I won’t tell a soul! I love pumpkin all year long. Did you make the oil-free pumpkin muffins? I haven’t had those in forever!!! Yes! The oil free pumpkin- yummmmm!!!! Yum! 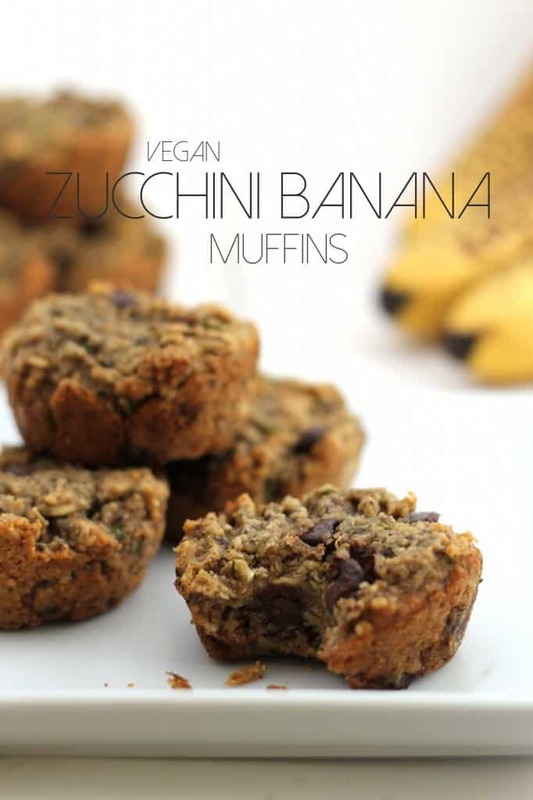 You are a genius at helping me use up zucchini and summer squash as part of healthy snacks. These are delicious and easy. I didn’t think it was possible to like another recipe more than the PB Zucchini Bars! Thanks. I’m so glad you liked them, Skye!! Hi there, just made your banana coconut muffins and they are superb! I normally have pretty good self control but I’ve already had two! I now want to try these and already have the oat flour so was wondering how much flour 1 cup of rolled oats yields after it is ground? Hi Sue! SO glad you’re loving the banana coconut muffins. I would go for a bit under one cup. Good luck! Just wanted to say that these are the best muffins I’ve ever made. Made them non-vegan with 2 eggs, also added a bit of flaked coconut otherwise followed the recipe and they were amazing! Will be making some more of your recipes soon, glad I stumbled across your blog! Awwww I’m so thrilled to hear that! I love the coconut addition. Thanks for reporting back! I substituted blueberries for the chocolate chips and they are delicious! Thanks for the recipe. Awesome idea, Crystal! You’re so welcome. I made these last night, alongside your almond Joy bars and my mouth & tummy LOVE ME! I put some almond butter on one of these babies this morning and would highly recommend that. Question… do you have the nutrition facts for these, that would be greatly appreciated! Hey there! So glad you’re enjoying everything :) Nope–I don’t calculate nutrition info. Feel free to enter the recipes into MyFitnessPal for easy nutrition info! I made these with 1 cup oat flour and 1 cup of brown rice flour since I didn’t have almond flour and I wanted to use up some of those random flours that have taken over one bin of my refrigerator. This made the batter a bit too thick so added around 1/2 to 3/4 cup of almond milk. Also stirred in some walnuts, just can’t have muffins without nuts! And 1/2 t ground cloves in addition to the cinnamon. Also used Sucanat, also becaue that’s what I had to use up! They’re in the oven now and they’re rising so all looks well. Mmmm love the cloves addition! I hope they worked well with Sucanat. Yum! I made these yesterday and they are so delicious! I made them into little muffins and just baked them for 12 minutes. I let the flax egg sit for a long time before using it and I think that helped. I’ve had to hide them because my kids and I just want to scarf them up in one sitting. Thank you for this recipe! These are totally delicious! My bananas weren’t quite as ripe as I wanted and I was out of coconut sugar, so I used about ⅓ c brown sugar. So yummy! Yay! That’s what I like to hear!! Thanks for the recipe! I made them and the insides were rather undercooked. Next time I am going to cook them longer, but do you have any suggestions to help with this issue? I had to use chia seed eggs because of a flax intolerance, so I’m not sure if that made a difference. Thanks!